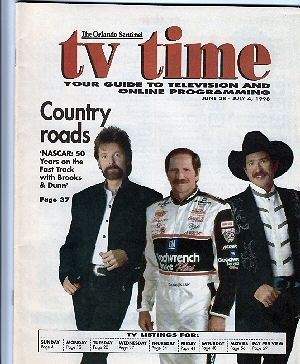 "Dale Earnhardt - Cover of TV Time - The Orlando Sentinel - June 28, 1998 "
(1932) Dale Earnhardt - Cover of TV Time - The Orlando Sentinel - June 28, 1998 - Condition: Excellent A wonderful picture of Dale Earnhardt with Brooks and Dunn. The article in the magazine was about a program that featured Brooks and Dunn country music done for the 50th Anniversary of Nascar. The program was called "Fifty Years on the Fast Track with Brooks and Dunn". The magazine measures 8" by 10" and has 75 pages. Price: $10.00 + Shipping.